Sat 15:Jul - 808 DJs - Mulingar, Ireland. Sat 08:Jul - 808 DJs - Madrid, Spain. Fri 30:Jun - 808 DJs - Battery Park @ Music Box - Manchester. Feat Headrillaz. Wed 21:Jun - 808 DJs - Leicester University. Wed 21:Jun - 808 DJs - Cambridge University. Sat 17:Jun - 808 DJs - Funkt @ Mass - Brixton, London. Thu 08:Jun - 808 DJs - Highrise @ Home - London. Thu 08:Jun - 808 DJs - Dogstar - Brixton, London. Sat 03:Jun - 808 DJs - Roufy's Benefit Gig @ Music Box - Manchester. Featuring Graham Massey. Fri 26:May - 808 DJs - Battery Park - The Music Box - Manchester. Featuring Darren Emmerson. Sun 30:Apr - 808 State live - Funkt - The Mass, Brixton - London. Gig report by Stephen Cade. Sat 29:Apr - 808 State live (warm-up gig) - Species - The New Trinity Centre - Bristol. 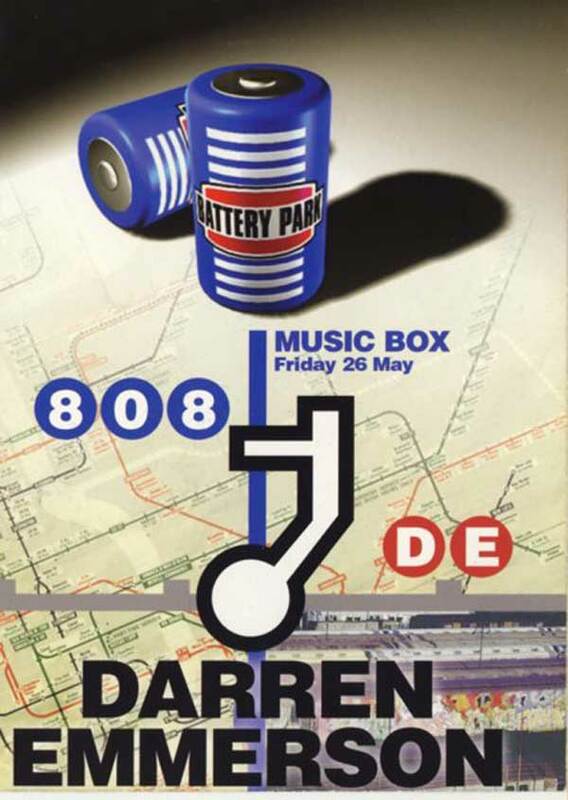 Fri 28:Apr - 808 DJs - Battery Park - The Music Box - Manchester. Featuring Dope Smugglaz. 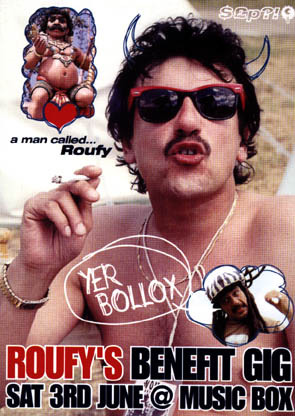 Fri 14:Apr - 808 DJs - The Rocket - Swansea. Thu 13:Apr - 808 DJs - Highrise @ Home - London. 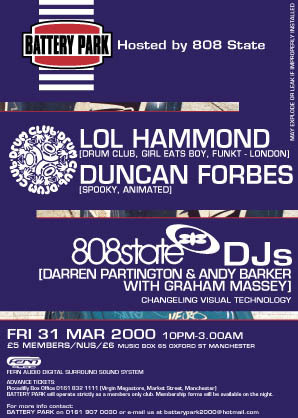 Fri 31:Mar - Battery Park @ The Music Box, Oxford Street, Manchester 10:00pm-3:00am. £5membs/nus/adv £6. Sat 25:Mar - 808 DJs - Arcane - Newcastle University. £7. Fri 25:Feb - 808 DJs - Battery Park @ Music Box - Manchester. Featuring Jon Carter. Thu 24:Feb - 808 DJs - Vicar Street - Dublin, Ireland. Sat 19:Feb - 808 DJs - Funkt @ Brixton Mass, London. Info thanks to Steve C.
Fri 18:Feb - Toolshed featuring Third Eye Foundation - Band on the Wall - Manchester. Fri 04:Feb - Homelife (808s bassman Paddy) live at Band on the Wall - Manchester. 10-piece band featuring Graham Massey on wind instruments. 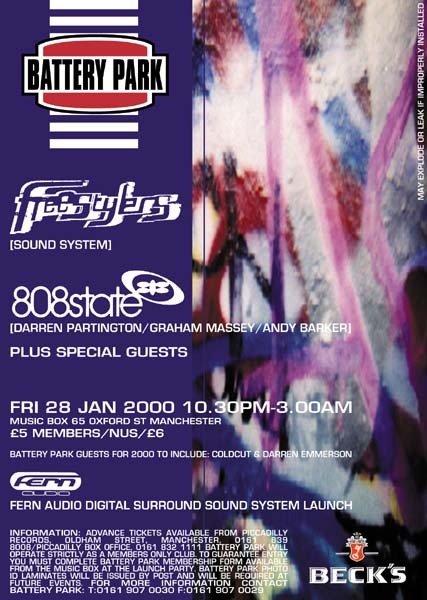 Fri 28:Jan - 808 DJs & Graham Massey: Battery Park @ Music Box - Manchester. Launch Party! This is a DJ gig.